West Virginia’s border with Virginia follows the summit of Allegheny Mountain from northeast to southwest for more than 100 miles. 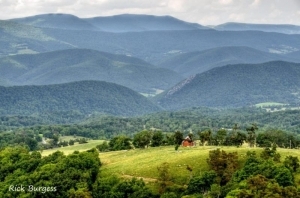 A principal ridge of a range in the southern Allegheny Mountains, Allegheny Mountain is located along the eastern edge of Pocahontas County and Greenbrier County in West Virginia. Elevations greater than 4,000 feet above sea level are exceeded along much of Allegheny Mountain. Among the important gaps and summits, from southwest to northeast, are Hickory Knob (3,309 ft.), Smith Knob, Rucker Gap, Chestnut Knob, High Top (Lookout Tower), Ryder Gap, Chestnut Levels, Mad Tom, Mad Sheep (4,225 ft.), Paddy Knob (4,477 ft.), Bald Knob, Watering Pond Knob, Bear Mountain, Top-of-Allegheny (site of Allegheny Battlefield Historical Site), Tamarack Ridge, and Grassy Knob.